I can’t think of a cooler place to be (in both senses) than Multia in Finland, on March 8 and 9. Even if you’re not competing in the Kicksled World Championships, lotteries, skiing shows, dog team sled rides for children, horseback riding and sleigh-riding will make it a weekend (or a Friday and Saturday) to be fondly remembered. But the fates would have him build fitness machines instead. Helsinki’s Vantaam Sanomat profiles Kickbike™ founder. “It is embarrassing to confess. I have been to all medical school courses on a schedule I could have finished. As soon as I could, I went to a doctor in the summer and did ten years of replacements, so I was not a fake doctor. “On call like crazy and at the same time I was trying to be a top athlete. Founded [Kickbike] in 1994. At the same time I was trying to work out and set up a family,” says Vierikko of the crazy years. All in all, he is responsible for the company’s product design and development, production and quality control as well as world-wide sales and marketing. Six kinds of Kickbikes annually sell about 5,000, Kicksleds less. In the land of the Kickbike™ the primal kicking sport reigns during winter and begins with the traditional Night of Ketkupolkka. Kickbike.com provides pictures, results, and here, a video from 5 December (see the camera mounted on Hannu’s sled). Last year, Paul Miles represented Britain in the Kicksled World Championships in Norway. He recounts his adventure in The Guardian. 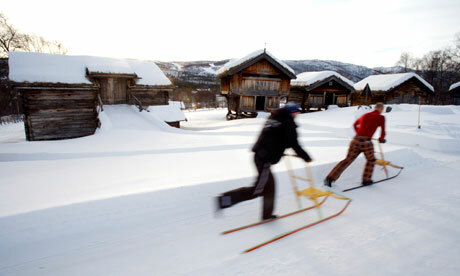 We arrived in Geilo (pronounced Yeah-lo) a day ahead of the race. The resort looked a picture in snow and sunshine, surrounded by gentle, flat-topped mountains. We arranged a spark training session with tour guide Niklas Sørensen, a stubbly-chinned twentysomething, dressed in black and, ominously, with two fingers bound in a splint. On 5 Dec. 2011 at Oulunkylä Ice Stadium the traditional Night of Ketkupolkka will take place. It is the opening event of the winter kicksledding season in Finland. Because of the mild autumn the race is held on artificial ice for the first time. Hey, I could live with artificial ice. 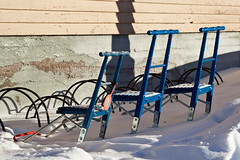 Although kicksledding is still part of everyday life in the Nordic countryside and small towns, there are no books presenting kicksledding as a fitness activity. This compact primer is written in order to guide beginning kicksledders as well as general sports enthusiasts by introducing the most important aspects of kicksledding, from its proud history to available equipment.